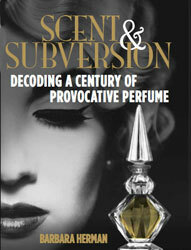 As if vintage perfume didn’t already present its fair share of mysteries to the modern sniffer, Coty’s ? Question Mark perfume ups the ante by placing a big honking question mark on its label. I've seen this several times on eBay, and my curiosity finally got the best of me. I got the tiny micro-mini you see to your left. Did Coty release a perfume called “?” and if so, why? The answer: yes and no. According to Cleopatra’s Boudoir, who appears to have gotten at least some of her info from Roulhac B. Toledano and Elizabeth Z. Coty’s book François Coty: Fragrance, Power, Money (Pelican Books, 2009), the resulting perfume was 1954’s Accomplice, which was then rereleased in 1973 as Complice. So, yes, Coty released a ? Question Mark perfume that was then renamed Accomplice. Having only the ? Question Mark Coty to sniff, I can say that it's an aldehydic floral with a balsamic, woody/powdery base, sheer light florals, and a hint of spiciness (carnation?) combined with a touch of fruit and musk. An hour into it, its buttery-rich, woody sandalwood almost smells like coconut (perhaps sandalwood and nitromusks create the sweet-fatty effects?). Like vintage Le Dix by Balenciaga (1947), ? Question Mark might also have some violet going on too. It reminds me a lot of Le Dix in notes and personality. If anyone has Accomplice (1954) or Complice (1973) and would like to swap a tiny amount of Coty ? Question Mark, let me know. As you can see from the above micromini bottle, I have a drop or so to share! But it would be interesting to see if they're all similar.
? sounds really nice. Wouldn't it be fun to find the entire contest package on eBay? sigh. Also, wonder who came up with the name! But most of all: It's so good to see you back here blogging! Hi breathesgelatin. I really missed it! But Im back in the saddle. I have a lot of vintage perfumes to review, and I forgot how much I love writing about them. As for the story behind ? and who won the contest, etc., maybe Ill do some sleuthing? I hope someone sends me some Accomplice and Complice! Hint, hint! Hi Barbara, I'm happy to see you're back blogging. Were you off finalising your book? Please let us all know how that's progressing. I do actually have minis of both Accomplice (bottle c. 1950s) and Complice (bottle c. 1980s), and would be more than happy to send you samples of both to compare with "?". Just recently I was in conversation with friends as to whether or not they were essentially the same scent (given that they do smell different to each other, but that might be simply due to aging/reformulation of the juice). I thought they were similar but my collector friend thought they were too different to be the same scent. So I'd certainly welcome your thoughts! Yes! Ive been finishing the book — its finished, in proofs now — and moved to NYC. Id love to try some samples of Accomplice and Complice, and Id love to send you some ?, but as you see, it wont be a lot. Lets compare them! Ill send you my address, and vice versa, although I probably already have it? Any updates on the Accomplice/Complice/? comparisons? I do love that Complice bottle. Stay tuned, Mals! I'll talk about what it smells like, too. Christine W. was kind enough to send me a sample, but it's in NYC and I'm in Cali.